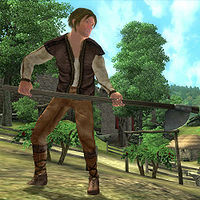 Davide Surilie is a Breton rogue living as a vintner in Skingrad. He is co-owner of the Surilie Vineyards along with his brother Gaston. His life revolves almost entirely around the vineyard, situated to the west of Skingrad, but his work there necessarily depends on the weather. Davide wakes at 6am each day and as long as it isn't raining, spends the day until 8pm hoeing the ground toward the southeast of the vineyard. If the weather is inclement, he prowls restlessly around his house instead. On sunny days, he'll leave the vineyard at noon and eat his lunch in his house between 1pm and 3pm. He takes his dinner from 8pm until 10pm, this time out in the open. He then heads for home, if not already there, and goes to bed at midnight. Davide wears a middle-class outfit of tan linen trousers, a brown shirt and thick cowhide shoes. He always carries some bread, so he never has to search for food, as well as his tools, a small amount of gold, and his key. In combat, David can use a leveled rogue spell, which will either be Invisibility, Chameleon, or Silence. Davide is proud of his wine too, but evidently has a friendly rivalry with fellow vintner, Tamika. When asked about Skingrad, Davide will tell you that "Gaston and I make great wines, reasonably priced. Skingrad has two great vintners - Tamika and Surilie. I'll never say a word against Tamika's wines." He will introduce himself by saying "I'm Davide, of Surilie Brothers Vineyard. Gaston is my brother. From our vineyards come the finest wines in Tamriel." but if asked whether his wines are better than Tamika's, will admit "Ah, well, in all honesty, no. But our wines are very good. And much cheaper than Tamika's very fine product, I assure you." His rustic life seems to be peaceful and without danger, but a paranoid Bosmer has suspicions about Davide and may ask you to investigate them. During the related quest, both Davide and his brother Gaston have the following observations about Glarthir: "You may have heard he's a bit touched in the head, and that may be true, but he's always been a quiet neighbor. Never given us any trouble." During the quest, several things can interfere with Davide's peaceful existence. If you deemed Davide guilty as conspirator, you will receive a List of Death from Glarthir. If you show this to Davide or Gaston, both brothers will set off at a running pace and kill Glarthir where he stands. Also, if you deemed him guilty but refuse to help Glarthir, Davide will join the People Glarthir Hates faction and will have to fight for his life against the Wood Elf. The Surilies' wine is much respected around Skingrad. Residents of the town will be overheard saying: "I bought some wine from Davide Surilie. Excellent body. He's a fine vintner. 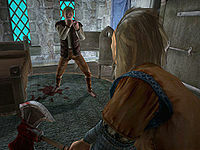 ", "Gaston Surilie and his brother Davide own one of the finest vineyards in all of Cyrodiil. ", and "Davide Surilie and his brother make some fine wines. It's a really impressive vineyard." Davide's morning work stint lasts for six hours from 6am, which means he will always head home at lunchtime regardless of the weather. The package should last for seven hours so that he eats lunch outside with his employees.